Wondering what to get dad this year? Check out our Father’s Day gift guide with a bunch of great present suggestions that he won’t want to return! Nespresso Inissia Espresso Maker: This compact and lightweight Espresso Maker delivers espresso perfection with a footprint small enough to fit into any interior design. Awesome Box: Give him the gift of personalized thoughtfulness with a customized Awesome Box of printed photo cards and messages. Enlist family members and friends in the memory preservation process. He’ll love looking through his stack of memories inside the beautifully printed 6×6 inch box. Tom & Teddy: Get him seaside ready with vibrant, stylish and fun swimwear from Tom & Teddy. And if you have boys – be sure to get them matching swim trunks – for the coolest father-son twinning look around! Hudson Made – Handcrafted Shave Brush No.26: Give him the gift of the perfect shave with this firm and dense shave brush to significantly improve his shaving game. New Balance Men’s M990V4 Running Shoe: Give him the gift of iconic style, comfort, and stability – with New Balance’s 990v4 for men. Continuing on the 30-year legacy of the 990 – this is the perfect sneaker for the whole family. Modern Glass Pyramid Succulent Terrarium Box: Spruce up his space with a great succulent or cacti tucked inside this elegant glass pyramid-shaped terrarium. The minimal design makes it suitable for other keepsakes in addition to plants. WIN IT! : We’re thrilled to send one lucky reader off on a shopping spree this Father’s Day with a $100 Amex Gift Card Giveaway. Enter to win via the below widget. Best of luck! Some samples provided for editorial consideration. This post contains affiliate links. The terrarium box is cool. These are incredible gift ideas for Dad and the Nespresso Inissia Espresso Maker would be great for my Dad because he loves drinking coffee! I think my husband would like the New Balance running shoes. Tom & Teddy looks like a fun company. My husband wants a grill. We are a bit financially strapped currently so idk if it will happen. I love the Nespresso Inissia coffee maker idea. The shoes would be nice! I haven’t figured out what to get my dad yet but I’d love the Modern Glass Pyramid Succulent Terrarium Box for myself. I just got my dad interested in running, so he would sure appreciate those running shoes! The Father’s day gift guide was a huge help. Thanks so much! I love looking for ideas for father’s day, these are some good ones. I love the Tom & Teddy matching Father/Son swim trunks, adorable! We are going to brunch on the 12th. We are celebrating early. These are all great ideas. I like the New Balance the best. That’s my go to brand. My husband would love new running shoes. i’m going to gift my dad a day at the spa! he always gets jealous when i give my mom a spa day for mother’s day so this year he gets one too! My husband would like the expresso machine. He loves that stuff. Thanks for this awesome list! My husband loves New Balances so I think I will give this a try! Great ideas. Thank you for the giveaway! Thanks for the ideas, I seriously needed help thinking of ideas for my dad this year. My dad is not an easy person to shop for, what he would like from this list is the sneakers-he loves working out and exercising, so sneakers always make him happy. That Nespresso Inissia Espresso Maker looks really great. These are great ideas, especially the terrarium. Hubby would love the New Balance Mens Running Shoes. That’s good gift guide. Thers’s some variety. These are great gift ideas! I really like the New Balance Men’s M990V4 Running Shoe for my husband. Looks comfortable for his feet! Nice gift ideas. My Dad would like the New Balance Shoes. I really like the terrarium. It’s always hard finding gifts for my dad for any occasion as he can be hard to buy for. If I win, I will buy cat supplies for my rescue cats. I have 13. Most are elderly. This will make Father’s Day buying very easy this year. I’ll send this link along to my Hubby’s boys, I think the running shoes would be a perfect gift. Hello, “Thank You” for this wonderful opportunity and for the “HOPE”! Good luck everyone. Be safe, take care, “GOD Bless”, sincerely Randy. There are some really nice prizes for this contest. Great Gift Ideas! My Husband Would Like The Modern Glass Pyramid Succulent Terrarium Box. I like these stylish ideas. It’s generally harder to come up with gift ideas for a man so creative gift suggestions are always appreciated! I always wanted to get my dad a remote control off road car. Thank you for honoring men and the contributions they make in creating healthy families by celebrating Father’s Day. Fathers Day will be a sad one this year. My dad just recently passed and am having the funeral tomorrow. I would love to get any of those gifts for fathers day. My husband would like the shave brush. That terrarium box is such a great idea! My hubby would love a pair of New Balance sneakers for Father’s Day! These are all great ideas. I know my husband could use some new running shoes and we both would use an espresso maker. The shave kit reminds me so much of my dad…I remember him dipping his brush into a mug with shave soap at the bottom. I miss him so much, but I do love my memories. I know a few dads who would really love any of these gift ideas! Loving that espresso maker! Great ideas! I like the Nespresso Inissia Espresso Maker. This would be nice to have. Great gift ideas. My dad would love the New Balance shoes. These are all fantastic gift ideas! Thanks so much for this post! This is a great giveaway! I love gift card giveaways. Thank you. This father’s day is a huge deal in our home. This is my hubby’s 1st father’s day as a father to be. We our due to have our 1st bundle of joy this November. Great espresso maker for my dad. This is a really wonderful selection of father’s day ideas! These sound like great gifts. The Nespresso Inissia Espresso Maker sounds lovely! Great gift guide, I would love a giftcard to be a gift from this guide! Shopping for Father’s Day is always difficult so thanks for some ideas. I need to get some ideas for my dad and my husband! These are nice gifts. It is good start early thinking about gifts, I typically do a food basket with a theme but it takes so much time to do it right! My husband would absolutely adore the New Balance running shoes! Great gift ideas, thanks for the giveaway! I love all of the gifts and the chance to win. Thanks for the opportunity. A little extra $$$ would come in handy right now! I would treat myself to something I would not ordinarily buy. These are great ideas for Father’s Day gifts. I’m sure my Dad would love the shoes. I think the espresso maker would be an awesome Father’s Day gift! Great. But I would take my husband to the movies. We go out for a nice dinner. Terrariums make such cool gifts! I love the Modern Glass Pyramid Succulent Terrarium Box! I really want to get the Shave Brush for my husband. It just seems so old school. Really cool! Great list. I find it always hard to buy gifts for my husband. Love the Nespresso Maker, I know he’d love one of those. I like the terrarium the best. These are all great ideas for Father’s Day.. thank you for sharing. Great ideas. My husband needs a new wallet. My father needs a new pair of New Balance running shoes. I love the Modern Glass Pyramid Succulent Terrarium Box. It would make a great gift for my husband this Father’s Day. I like the New Balance running shoes for my husband! I would use the AMEX GC for the Nespresso machine. My step dad could really use the running shoes I’m excited for these in this gift guide. These are some great ideas for Father’s Day. I love the Modern Glass Pyramid Succulent Terrarium Box. Great ideas, I would like some of the gifts hehe! My hubby could use some new boots. This would be a big help and assist in giving him a great surprise and an unexpected gift on fathers day. He’s a pretty amazing dude. Shoes are definitely top on my hubby’s list. I love the idea of the awesome box as well. I like the Tom & Teddy trunks idea. I love the new balance shoes! Thanks for the chance! That Hudson Made Handcrafted Shave Brush is great! Some really great ideas. The running shoes would be great for my husband. Oh those are all such great ideas! My dad is one of those that is so hard to shop for! I LOVE the idea of the Modern Glass Pyramid Succulent Terrarium Box!!! He would love that! I like the espresso maker. I found you on twitter looking for a good list. Thank you for all these wonderful ideas! The New Balance Men’s M990V4 Running Shoe would make a great present for my husband for Father’s Day. He is a marathon runner and goes through running shoes pretty quickly. He lives in running shoes it seems! Thanks for the idea. I always have such difficulty thinking of gifts to buy the men in my life for Father’s Day, but I love these ideas! My dad would love the shave brush and my husband would love the espresso maker. Thank you for sharing these great ideas! Winning the American Express Card would take the Father’s Day gift buying decision out of my hands, and transfer them to my father’s hands! Letting Dad decide what he wants this year. I think he has enough neck ties to open a store and no more cigars ever. Thanks for the ideas. My husband would love a new pair of sneakers. I guess I should grab a pair. This is a great gift guide. I like the Pyramid Succulent Terrarium Box the most. Thank you for the giveaway! I have a few gifts in mind for my dad. He collects fishing lures, knives, & music equipment. This would really help pay for a great father’s day gift. I have some fishing gifts in mind for my dad now that he’s back home in Wyoming! The Awesome Box sounds amazing! (I am totally getting teary eyed thinking of all the possibilities;))! I’m getting daddy a new pillow! These are so awesome Father’s Day gift ideas! Great gift ideas! I’ve been thinking about getting my husband a pair of New Balances for Fathers Day. 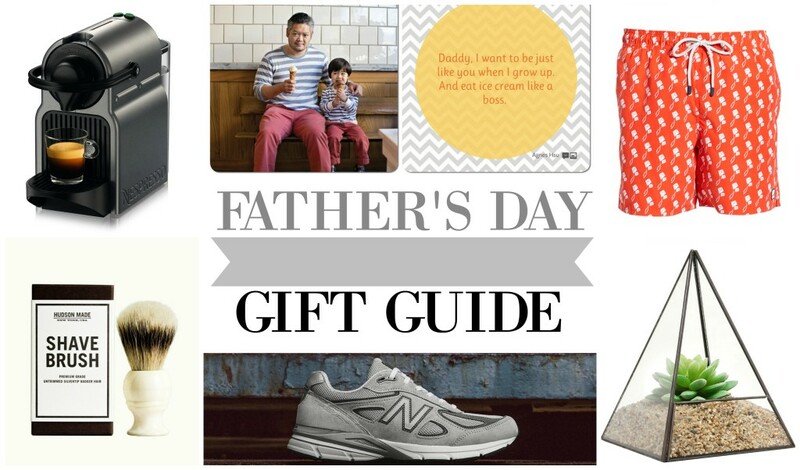 Thanks for sharing this Father’s day gift guide. I think shopping for a Father’s Day gift is so difficult and this guide help give me some ideas. I love the shave brush idea, there’s nothing better than using a shave brush while shaving! This would be so awesome. Thank you for the chance! What great gift ideas. Thanks for the chance. My Dad would love the terrarium. My dad would love the Nespresso Espresso Maker and I love that it’s so compact and stylish. My hubby is a shoe freak so I know he would like the New Balance sneakers. Thank you! My dad could use the New Balance shoes. My Dad would really like the Nespresso Inissia Espresso Maker – he is definitely a coffee lover. The Modern Glass Pyramid Succulent Terrarium Box is such a unique thing. This would be a great gift to give. Thanks for sharing. What a great post, and I love the sleek look of you’re blog. 🙂 Thanks for the giveaway! Any of these gifts would be an awesome fathers day present! I think any guy would be lucky to be gifted any of those great gifts, especially like the Modern Glass Pyramid Succulent Terrarium Box. These are great items for a fathers day gift but I would like to add one that every father would enjoy also and that is a grill! The Modern Glass Pyramid Succulent Terrarium Box would look awesome on his desk at work! What great Father’s Day gift ideas! Great ideas! I especially like the Awesome Box idea! It would be a great way to make something special! I think I’ll get my father the running sneakers. I’d love to have that little espresso maker. Those are all great gift ideas for dad and your husband. Great gift ideas! I would love to spoil my husband this father’s day. My Dad would like the New Balance shoes. My father would really like the shaving brush. He has used one for years. Thi si s great little list. My husband and I are both fans of running and I know a new set of sneakers would go over well for Father’s day, but that shave set looks pretty cool too. So many ideas now! What great ideas for the man in my life. Sometimes he is such an enigma. He walks a lot for exercise so the shoes look like the best idea though he loves his caffeine too. This is a great gift guide for father’s day. I really like the succulent. Wonderful gift ideas, I probably wouldn’t of thought of these things and thanks for the opportunity to enter sweepstakes! I am thinking of getting my husband’s car detailed for Father’s day. I would use this for my son, the father of 2 beautiful boys! The running shoe would be great. My husband is weird and LIKES to run. Shaking my head! Men are always so hard to shop for! these are good ideas! Nice Father’s Day guide. New Balance shoes are a good idea! There are a many cool things you show, that would be perfect for my Dad. The espresso maker would be a great gift! The pyramid terrarium strikes my fancy. These would be great Father’s Day gifts. Just in time for father’s day! I can’t believe we’re coming up on Father’s Day already. The year is flying by. Thanks for the giveaway! My husband could use a great pair of New Balance shoes. Lots of Fabulous ideas for my hubby! I think we may do the shave brush from the kiddos! it looks like something my hubby would actually get some good use out of! Thanks so much for the chances to win. New Balance Men’s M990V4 Running Shoe are great sneakers!! What great gift ideas. I know my hubby would love a couple of them for Father’s Day. I love all of these great dad’s day gift ideas listed! Any man/dad would love these gift ideas. Hope its mine. Great gift ideas for father’s day! My hubby would love the running shoes. Those are some awesome gift ideas. I especially love the terrarium box. Great gift ideas! I like to take my dad out to a state park for a hike for fathers day! I love that terrarium! I would honestly have a house full of succulents if I could. What a great gift guide! The dads in my life will never say what they presents they want. Thanks for the great ideas, my Dad is incredibly difficult to shop for. I like the swim things from Tom & Teddy. These are some fun Father’s Day ideas. I have been trying to come up with something for my husband this year. I really like the Modern Glass Pyramid Succulent Terrarium Box above. Great Father’s Day gift ideas are found at this great site. These are awesome father’s day ideas! Love this blog. These are great Father’s Day gift ideas. Father’s Day is harder to buy for but there are some great items to choose. I love the tom and teddy swimwear! Especially so I can get matching for my son! Great choices for gifts. As a bunch have said my stepfather can be incredibly hard to shop for. I would probably go with the Pyramid Terrarium just because it’s something kind of different, he can put it in his office, nothing too big to try to find a spot for. I think he’d like that. i love the sneakers and expresso maker! I think my father would love all these gifts. These are all great ideas. I cannot wait to go shopping. I had never heard of Tom & Teddy…but my hubby could definitely use some beach attire for our vacation later this summer! I love looking for ideas for father’s day. Great ideas. My hubby could use the New Balance shoes. You selected some great fathers day gifts. My hubby would love the New Balance Men’s M990V4 Running Shoe from your list. He also is a tech guy so things like portable hard drives, power packs for when electricity goes out are great too. my dad wants a new grill this year so my sisters & I are all pitching in to get him a great one! What an interesting and varied guide for Father’s day! We always go out to eat for brunch but I like to get both my Dad and my Husband something more for their day, and you’ve given me some great options to ponder. Thank you too for the giveaway! This is the best prize bundle I’ve ever seen. My husband would love them all. What a great guide for father’s day. thanks for posting!! Great Father’s Day gift ideas. Love the sneakers. That terrarium is so cool! Thanks for the opportunity to enter a fun giveaway. I like the blog! The Hudson Made – Handcrafted Shave Brush No.26 would make a great Father’s Day gift for my Dad. I would keep the Modern Glass Pyramid Succulent Terrarium Box: just for myself.. Okay wait, if it is in the house I can claim it right! My dad is obsessed with his keurig and I’m sure he would love that espresso maker! Great ideas! My husband would love a nespresso! Thanks for the giveaway and great Father’s Day ideas. At 61, husband is the Best father and papa that I’ve ever known and he would love some new New Balance shoes as he is trying to get and stay in shape for his girls and himself!! Best shoes ever for Health-walkers!! Supports your whole body. Great list of gifts and he is worth Every one!!!! I didn’t realize Father’s Day was so close! I like the Tom & Teddy matching swim trunks idea! It would be so fun to see my husband and 5-year-old wearing matching swimsuits! Great ideas! My husband would like the New Balance running shoes. This is a great guide! My husband would like the espresso maker! Thanks for the great father’s day gift ideas! Sometimes it can be hard to think up something he’ll like. I bet he’d love that Nespresso!! My hubby would love a new pair of New Balance running shoes! He would also really use the shave brush! Great gift ideas! I love those Tom and Teddy swim trunks! My little boy would love matching swim trunks with daddy! The Nespresso Inissia Espresso Maker would be so perfect for my hubby. He loves his specialty coffee style frinks especially when he is going fishing. I always thought buying baseball/football tickets and going to the games with him was a good idea. My husband would really love a nice pair of running shoes. He is a wonderful father and husband. I’m so thankful for him! Father’s day can be a hard holiday to shop for…thanks for the ideas! That succulent terrarium box is so neat! Great giveaway, my husband would love it. I love these father day ideas, my husband loves to run so running shoes would be a great gift for him. Great list hop I win! The new balance running shoes is a great present for my husband. I would love to get some Tom & Teddy for my boys! So cute! A nice variety of gift ideas. My son would really like the New Balance running shoes. Unfortunately my dad just recently passed away. I’m having a hard time with Father’s Day right around the corner. To make me feel not so bad about not being able to get my Father a gift I am buying my son a gift as he is a father. Any of these would be a great choice. These are all terrific ideas but if I know my dad he’d blow the entire thing on either tools, ammo or he’ll put it toward a new gun. I would love some new running because I just started going back to the gym. Thanks for the ideas. I’m thinking of getting my husband a pair of New Balance Men’s M990V4 Running Shoes. My husband would love all these gifts!! I love all the awesome ideas for Father’s Day gifts!! My dad would really like the Hudson Made – Handcrafted Shave Brush No.26! This is a great Father’s Day prize package. Thank you for the chance to win. I love your review Father Day gift suggestions. Each would make a great gift. I’d love to be able to buy my dad something special for Father’s Day, and winning this would sure help! Thanks for the opportunity! Seriously considering getting dad those beautiful New Balance Men’s M990V4 Running Shoes for Father’s Day! Thank you for the great list. Great gift ideas— the shave set pictured is definitely up my husband’s alley! The Nespresso Inissia Espresso Maker looks great! I had never heard of Tom & Teddy until now, they have great swimsuits! Ooh these are some great father’s day gift ideas! What guy wouldn’t love one of those? New Balance Men’s M990V4 Running Shoe:are amazing shoes my family loves wearing them. While I got many ideas for my sons father for Father’s Day….sadly my own father has passed. However, I am so glad to have found the Modern Glass Pyramid Succulent Terrarium Box. My brother would absolutely love that! He is Mr. Green Thumb. I love the unique idea of the terrarium box for a Father’s Day gift! Nice gift ideas for dad’s. My husband really needs new walking shoes so would love the New Balance for him, thanks! i haven’t decided what to get my dad this year yet. I hope that i get him something he likes though. Fathers day is a blast for the whole family. The BBQing, just doing whatever Dad wants to do. We have 3 boys and it has been a tradition for the boys to get him some sort of knife. The New Balance shoes are a great idea! I think I’ll do that this year. These are super ideas for Father’s Day! My dad likes gardening stuff, so I’ll probably get him something for his garden. I always struggle with trying to figure out what to buy for Father’s Day. I love these ideas. I love the awesome box. I think it will be a great gift for my husband. My husband would love the a new pair of shoes! Such great ideas! Need to decide what to get my dad! Great suggestions! Happy Fathers day to all those great Dads out there! These are great ideas for Father’s Day. I haven’t thought about shopping yet. The terrarium would look great in my husbands office. I would like to get the New Balance running shoes for my Dad. My husband once gave me a glass pyramid. Unfortunately, a cat broke it. I’d love to give him this one. It’s so cool! I’ll have to bookmark the store. Thanks! I could def use this for the potable speakers my husband wanted!! So many great Fathers Day gift ideas. Great gift ideas! Thx for the inspiration! These are some great Father’s Day ideas! My husband wanted the new Nintendo Vans for Father’s Day, so he’s definitely getting them. i’d love to win. we could go out to dinner. This would be so awesome to use to take my hubby out to an awesome dinner! Forget the Dads (just kidding), I want the Nespresso Inissia Espresso Maker for myself. I like the Awesome Box. This is a very nice gift guide, thank you. These are great ideas for fathers. I really like the Terriarium Box. That shave brush is gorgeous! new sneakers are always good … need to get the whole family walking as much as possible … need to keep everyone healthy. I see some nice gift ideas for my dad! All of these would make a great gift. I would of never thought of a terrarium but that’s a great gift…other good ideas are tickets to sporting events, duffle bags for getaways, beer making kits or components to make his fave cocktail. These are some wonderful ideas for Father’s Day. It is very hard to find something for men, they are so particular about what they want or like. Well at least the men in my family. Thank you for the giveaway. Would love to win this so I could buy the dad in my life something great. My husband loves Nubalance shoes like you posted a pic of. The gift card would certainly help towards the price. I like the idea of a terrarium. It is nice to see several gift ideas that are totally different from the classic tie fallback gift! The Nespresso Inissia Espresso Maker is a great idea!! I would love this to buy my dad a special gift for fathers day. Great gift ideas!! Thank you for the chance! That Modern Glass Pyramid Succulent Terrarium Box is so fabulous! I love that terrarium box and I think my hubs would too! These are some good ideas My son would like to have the New Balance Men’s M990V4 Running Shoe. Really good gift ideas for lots of different Dads! My Dad would love to just love the New Balance shoes! Thank you!! Happy Fathers day to all the dads and moms out there that take care the family. My dad would really like the Nespresso espresso maker. He retired a while back so he no longer drinks coffee just for the caffeine and he surprised me a while back by mentioning trying different kinds of coffee. I think he’d like to try a different style of coffee too! We will be grilling out and spending time with family this year for Fathers Day. I really like most of those gift ideas but I think my husband would absolutely love the glass pyramid. I am always in need of ideas for Father’s Day. He could use some new sneakers… maybe some shirts. i love the idea of the awesome box. i feel like most dads would love it, i know mine would. Thank you so much for hosting! There are some great ideas here. I commented on A City’s Staycasion as Sue Hull. Would love the Modern Glass Pyramid Succulent Terrarium Box for my office desk ! This is helpful because my dad is hard to shop for. Hello and Welcome! Join us as we celebrate creative family living and more.